Kim over at Shabby, Pink and Pretty is again hosting Teacup Tuesday. This dainty little teacup almost did not make it home with me. I found this cup and saucer on one of our trips to the windy city. We actually drove up into Wisconsin to the town of Racine. There were several really interesting places to browse for treasures. We found the Antique mall that was in the old school house. Rooms upon rooms of wonderful old things. After we had spent quite a bit of time in the old school house, we were heading out of town when we saw a sign for a thrift store. It was in the basement of an old church. It was not a very large place, but it was filled with lots and lots of glass ware. I found this cup and saucer, with the marking "Lorraine" Made in England. I almost left it, because the cup was very heavily stained on the inside. But the cute little flowers just beckoned me to "please take me home". The ring of flowers are decorated all around the inside of the cup. I could just imagine a whole service of this lovely china. So to my delightful surprise, on our recent trip to Georgia, I found two more cups of this very same pattern. No saucers, but the two teacups are in perfect condition. No grazing and no stains! So now the mission, if I choose to accept it, is to find two more saucers to match these delightful teacups that I have added to my collection. Please stop over at Kim's blog and visit the other Teacup Tuesday offerings. One afternoon in 1938 a 17 year old young girl went to visit her friend after school. The girls chatted about things most 17 year olds chat about. Her friend was preparing for her date to pick her up. When the date showed up, he took one look at his dates friend, and was lost forever. Four years later, 21 year old Ruth married 22 year old George and started a life together that has weathered 67 years. They built a home that would be surrounded by love and devotion. During their first year of marriage, George was called to serve his country during World War II. It was a lonely separation, and Ruth would travel to be with George wherever he was stationed. He was finally shipped out to France. During his time overseas a baby was born, and the lonely mother birthed him without her loving husband by her side. When Ruth nearly died this past February, George faithfully sat by her side, not saying much, but just keeping his vigil. As she has been recovering at home, he brings her roses from the garden. He leans over and kisses her tenderly. My sister in love made this quilt for her parents a couple of years ago. The pictures of the bride and groom, and their five children. Ruth and George welcoming their 14th Great Grand child in May of this year. Storms have come and storms have gone, but the love that sustained these two people has weathered the test of time. As you walk hand in hand, serving God, may you gather the petals of blessings that have been showered on your life together. What makes Afternoon tea so special?? Well one thing is good food. Pretty tea cups. And the tea, of course. The ambiance of the tea room. But mostly it is having tea with a special lady. Today I enjoyed tea with a sweet "new" friend. We met for tea and talked, and talked. It was good "girlfriend" time. We enjoyed getting to know each other a little better. So here are a few pictures from our most enjoyable Afternoon tea. Silver service on the mantle. A charming sofa area where tea and lunch can also be served. So much fun and beauty, even in the Ladies powder room. These murals are painted on the wall of the Ladies powder room. I hope that your day has been as delightful as mine. SewMamaSew is celebrating June as Sewing Machine month. They will be keeping a running list of Brand/Model “reviews” and publish the list at the end of Sewing Machine Month. I made this quilt top back when I was doing some tea dying. I tea dyed the muslin blocks to make them look like old fabric. I've tea dyed before, but this one was meant to look splotchy. Now this little beauty I really love. I think the pattern is called Magic Trip. It is a variation of the quilt around the world. It was so incredibly easy, and it turned out so big!! But I just love the floral fabric. A little closer look at the fabrics. Here is a rare thing for me. An applique top. I need to decide on some kind of border. oh-oh Crispy, I think I see more ufo's lurking. Somehow I've got to get busy with the quilting part. Sigh........ too much pretty fabric to play with. We've never eaten here before, so it was a real treat, and I must say that the food was very delicious. Thanks for the best 25 years! From day one, you've been a delightful loving son. Wishing you many, many more. I first read about the MN Quilt Designers Shop Hop on Perkins Dry Goods blog. Today starts 10 days of online blog shop hopping. 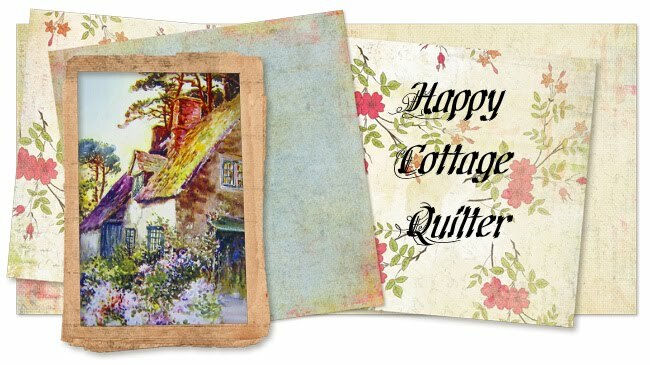 Minnesota Quilt Designers Blog Hop June 22 to July 3! Each blog will have a project or tutorial on the days listed below. Doesn't this sound like fun?? You must go to GE Designs today and enter a comment on her blog. Check out her tutorial. Then for the next 9 days check out the other designers. I have never really been a very good math student, but recently I have noticed that the number of followers on my blog is nearing 100! So wouldn't it be a nice thing to have a little giveaway for all of you wonderful folks out there who read my blog and encourage me every day?? Barbara at Bejeweled Quilts recently had a giveaway for her 100 followers and I thought it was a great idea! Let me see .............. 100 minus 87 equals 13! I enjoy things from the past. Stories, music, collectibles. There are some things that I've obtained recently and others that have a special place in my heart. Years ago my hubby and I used to travel up to a little fishing village called Cedar Key. My dear hubby had been going there since he was about 16 years old. His Dad knew a family there and would go every year to hunt in the deep woods. The first time my hubby went on one of their trips he met the patriarch, who at that time was confined to his sick bed. The old clapboard house was a typical Florida wood house with four rooms, windows on all sides to let the cool breeze pass through. By the time I came around, Mr. Dorsett was long gone, and his widow and disabled son had moved into a trailer just a few yards from the old homestead. We would go up to Cedar Key and grab a bite of the best seafood around. The restaurants were located right out by the water. We would enjoy cabbage palm salad and a huge shrimp dinner. Topped off with delicious home made key lime pie. Every time we drove up to Cedar Key we would stop in to visit with Mrs. Dorsett and her son, Alf. She would always welcome us in and Alf would tell all of his latest news. Mrs. Dorsett's family were original to the area, and we heard all about her two spinster sisters who still lived in the "big" house down by the water. They were both in their 90's. There were stories of the lynching back in the 20's. Of the pencil factory that gave Cedar Key its means of work for those who lived there. There was the old cemetery with lots of headstones dated from the 1800's. Some of the small plots were the babies that died during the "pox." We heard about the pine sap that was annually tapped out of the woods. We even found a few of the clay pots that had been used to sap the trees. It was all so fascinating. Recently on a visit to The Red Geranium Cottage blog I noticed a piece a furniture that Sharon's dear hubby had made. I asked about it, and told Sharon that I had a similar piece. I promised Sharon that I would post a picture on my blog. Mrs. Dorsett had asked my dear hubby to look for something in her "barn." While he was rummaging through there, he saw this old piece of furniture. Now mind you, it did not look like this. It had been painted with a milk paint and the screens were torn. But my hubby asked about it, and Mrs. Dorsett said that if we wanted that old thing we could have it. She told us that it had been a wedding present when she got married. But she wanted us to know that "it had been used" when it was given to her. She had married young (13-15??) to the older Mr. Dorsett. She was in her early 80's when I met her. So the safe was already about 65 years old when it came home with us 30 years ago. My dear hubby and a carpenter friend took the whole thing apart, stripped down the milk paint and sanded, sanded, sanded. The front is a beautiful oak, but the backboard is pine. We were told that many of the older pieces used cheaper cuts of wood on the backs. It is a piece that I have enjoyed for many years. It holds a lot of my teacup collection, but it would also serve well for quilts. There is a story behind every old thing that I own. It reminds me of people or places. It's sometimes like stepping back to a simpler time. Sitting on the front porch, rocking in the rocking chair, sipping a glass of cool lemonade, as you visit with your neighbor passing by. Last night I had a bit of scare. I started having flashing lights in one of my eyes, and a round patchy thing where I could not see. I became very concerned and even was shaking a bit. This morning I called my eye Doctor, who of course was booked solid. So I went in to see one of his associates. She was a very nice young doctor who looked in my eyes in every possible way and angle. The verdict was that my eyes were perfectly fine, except for maybe being a little dry. She told me that I had a visual phenomenon called Migraine Scotoma or "scintillating scotoma". I guess in other words it was like a migraine in your eye. Apparently it happens mostly when under stress or lack of sleep. The paper she gave me said that migraine episodes usually are triggered by some kind of stress. And (get this) most often occur in people who are intelligent, hardworking, and compulsive. I have never thought of myself as compulsive, but there has been a little stress around here from time to time. Anyway, I am just SO grateful that my eyes are healthy and there was nothing to be done. God has blessed me with a healthy body that HE made. My prayer today was "Be anxious for nothing but in everything by prayer and supplication with thanksgiving let your requests be made known to God. And the peace of God, which surpasses all comprehension, shall guard your hearts and your minds in Christ Jesus". Something has been brewing in my head for a while now. I have been fascinated with Karen Griska's Selvage Blog. She has showcased so many wonderfully creative things made with a piece of fiber that we have thrown away for years. I am in awe at the creativity which comes across her path. Recently I found a very cute doll form. It was just an interesting item that caught my fancy. I brought the form home, and even though I am not a garment sewer, it has been fun to look at the form and think about how to use it. But a vision kept coming into my mind. Can you guess what it was?? I found some pretty little buttons at the fabric store yesterday, and just had to add it to the dress. And if you will bear with me for just one more selvage project. My dear sweet husband and I have never had the same cell phones. But recently we both ended up with the same phone and holster. So every once in a while we are looking at a phone and asking "is this mine?? ", or "have you seen the holster for my phone?" Well as I was playing with the selvages, I thought I would try to make something to distinguish my phone holster from his. Betcha he won't be taking that one to the office. Don't you just love it when you receive a package in the mail?? And what a surprise I had when I received a package that was not from a giveaway! It was from a very dear and generous lady. Marydon from Feedsack Fantasy sent me a little love package. There were two very sweet blank note cards with a teabag inserted inside the teacup. I do love teacups. Look at these gorgeous Maywood Studios fat quarters! and they are PINK!!! My favorite color. Marydon, you are such a kind, sincere, joyful lady with a heart as big as the whole outdoors. Thank you dear lady. I am blessed to call you my friend. This very sweet teacup belonged to a very special friend of mine. She had quite a healthy collection of English teacups. The bottom of this teacup has a crown and says Bone China Made in England. No pattern name. The saucer was very heavily grazed, and there was a lot of staining imbedded into the the grazing. I have given it a mild bleach soaking to try to lift some of the stains. The stains are not completely gone, but they are not as noticeable. I love the little floral spray inside the cup. Such a delight to look at when you are sipping a cuppa. One day soon I will share with you about the special friend that was the mistress of this teacup. Have a wonder filled day! Be sure to stop by Kim's blog and visit the other Teacup Tuesday offerings. Have you ever started working on a quilt and decided right from the start that you didn't like it?? I usually don't like to work with fabric that isn't appealing to me. But it does happen, right?? Several years ago I bought this fabric with reds, blues, pinks and yellow. There was a complimentary fabric (which you can just see peeking at the left corner) that had a smaller print with cherries and raspberries. I decided on the Card Trick pattern, and put the main fabric together with blue, yellow and dark pink. For some reason, this quilt just did not appeal to me at the time. So it was relegated to the UFO pile. As I was working on cleaning up my sewing area one day, I came across this quilt once again. But this time it started to speak to me. Now I must decide on a backing and how to quilt it. It is about 86" x 72". Have you ever been to a place called Paradise?? I am so fortunate to live in a place of balmy days and enduring sunshine. Many friends that visit from the north expect to see only sand, seashore, flamingos and palm trees. I never tire of the beauty that surrounds me. There are certainly some places that fall short, but when we look for the good, we will almost always find some ray of sunshine. Have a very wonder filled weekend!